The latest Intel roadmap leak has confirmed that Haswell M-Series (Mobile) processors would launch in 1H of 2013 along with newer Ivy Bridge mobile chips in Q4 2012 and Q1 of 2013. 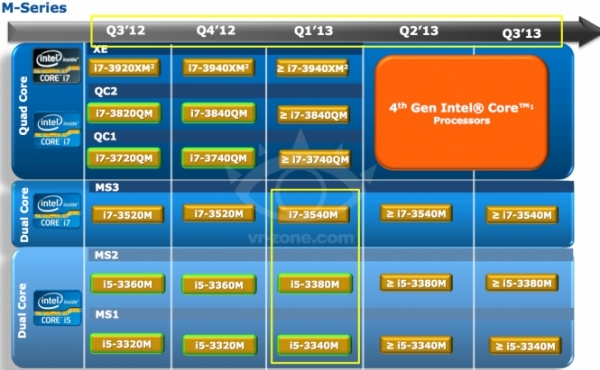 The roadmap shows that Intel’s fourth generation processors known as Haswell would launch in Q2/Q3 2013 featuring a new 22nm Tri-gate architecture which would bring improved IPC performance over Ivy Bridge. Coming down onto the Ultrabooks category, the new U series processors will be inducted in the first quarter of 2013 namely the Core i7-3687U and the Core i5-3437U. This update will stay until third quarter of 2013 after which Haswell will take its place. For more details on Intel’s Haswell platform, head over here.